The heart chakra is the gateway between the upper and lower chakras, and is connected to the last of the four elements, the element of air. This energy center is associated with unconditional love, compassion, and joy. It is the source of deep and profound truths that cannot be expressed in words. The fourth chakra is located in the heart. It deals with love and is blocked by grief. Where can you soften and open? What can you let go of that blocks this chakra? Lay all your grief out in front of you, forgive and let go, knowing that love is pure energy, swirling all around us. I love. I love myself.m I am a being of compassion. I share this love to everyone. I live in balance, with grace, and gratitude. I release all fears, concerns and worries about giving and receiving love. I know forgiveness. I am one. 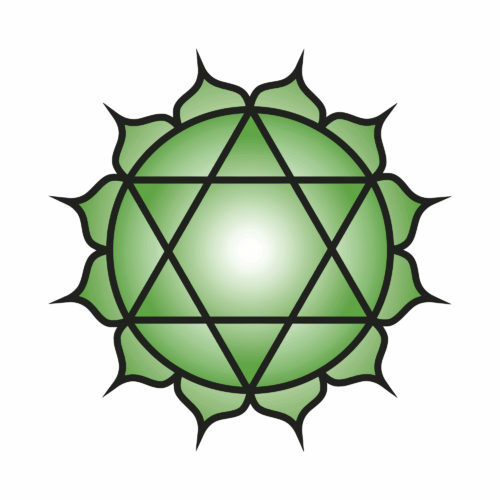 Symbol: A circular flower with twelve green petals called the heart-mind. Within it is a yantra of two intersecting triangles, forming a hexagram, symbolizing a union of the male and female. Mudra: Padma Mudra – This lotus-inpired mudra calls forth new possibilities and invites in love. Blocked: Heartache, fear, guilt, lack of openness and trust, co-dependency, jealousy, fear of abandonment, anger, sadness, loneliness, bitterness. Open: Give/receive love freely, openhearted, trusting, compassionate towards self and others, grateful, allows love, happiness and joy.